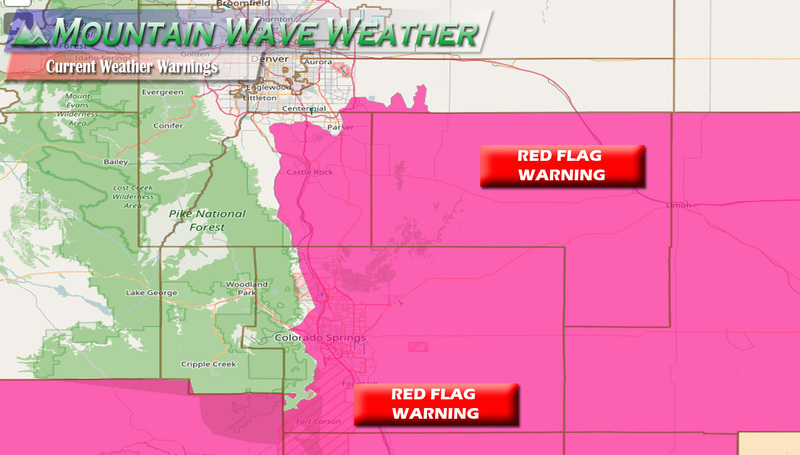 A new Red Flag Warning has been issued for many areas along the Palmer Divide today as warm temperatures combined with low humidity and gusty winds will make for extreme fire danger. 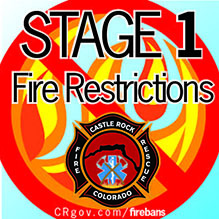 Wednesday’s Red Flag Warning is in effect from 11AM-6PM and includes Castle Rock and most of the Palmer Divide Region. 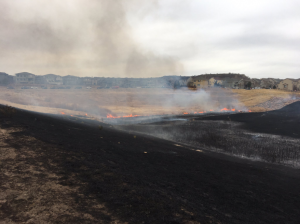 The Red Flag Warning today comes as a handful of new fires is starting around the area each day, keep firefighters very busy! 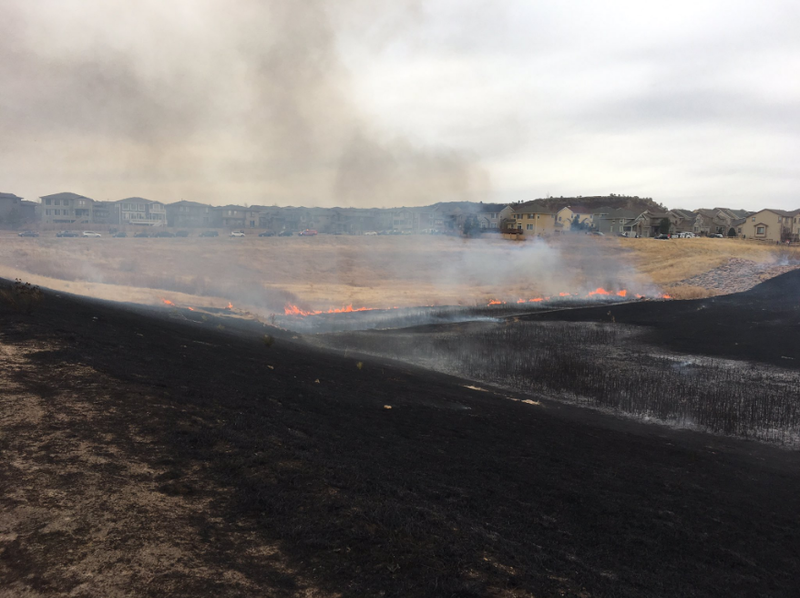 South Metro Fire Rescue has been responding to several calls through the day over the past week as dry conditions in and around Douglas County have aided in extreme fire growth and behavior. A storm system moving through for the second half the week is expected to drop temperatures substantially along the front range. 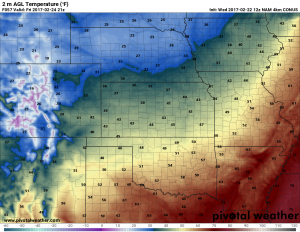 Look at that cold front! Friday’s high temperatures will be among the coldest we’ve seen in weeks! This may be a bit of a shock to those who have been acclimating to the warm, spring-like temperatures we have had for the better part of a month. In fact, Friday’s high temperatures will struggle to reach into the 30’s! With the storm system bringing in the cold air from the North, you would think we would see a bit of moisture with this storm, but we generally have a hard time squeezing snow or rain out of storm systems with this type of track. Read More: See the same models we do on our new Weather Dashboard! 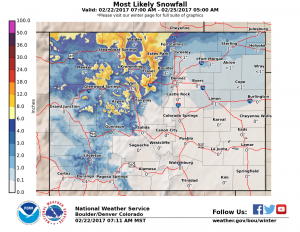 The low pressure center for this storm is expected to set up too far North to bring decent upslope to most areas South of Loveland. 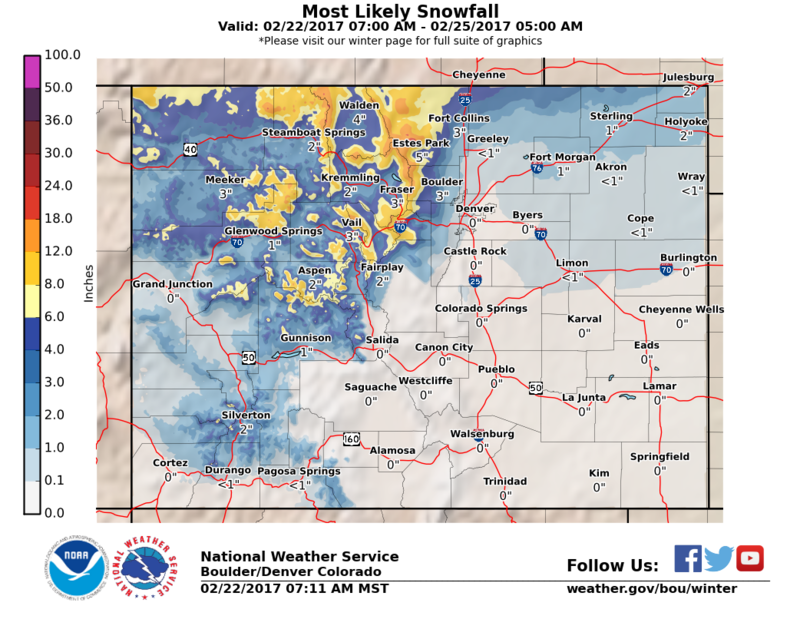 The most likely snowfall probabilities from the NWS Office in Denver show most of the Palmer Divide region left out with snow. The one exception is the far Eastern areas of Douglas and Elbert county where up to an inch may fall. The image above is from an article I’m working on detailing what ingredients we need for big snow storms. 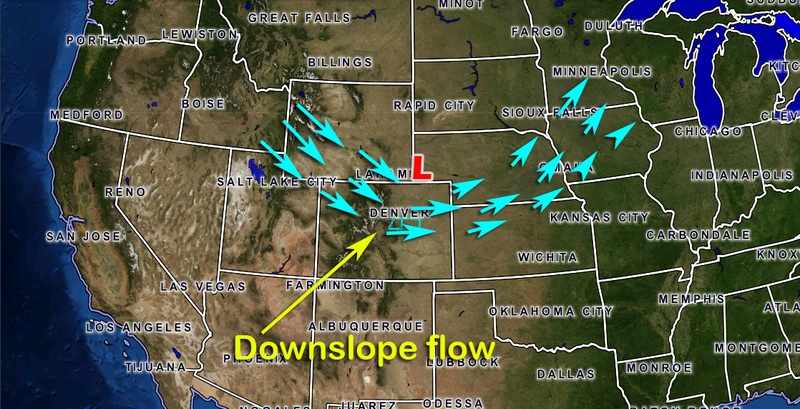 It illustrates our setup this week quite nicely; the low sets up too far North meaning most of the areas along the front range experience downslope conditions. 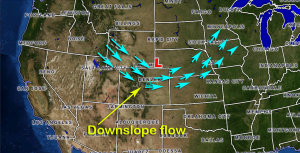 Downsloping causes the air (especially at the surface) to remain very dry and any moisture in the air has a difficult time falling. Originally this storm system was looking more impressive earlier in the week but as models have shiften the low further North confidence is growing that this storm will be a very minor event. Light snow will be possible Wednesday night into Thursday and into Thursday night. If model trends continue most areas South of Denver will only experience cloudy and windy conditions. Due to the warmth of the ground and light rate of snowfall, little accumulation looks likely. 0-1 inches is still the most likely range we see by the storm’s exit on Friday. Emphasization will go to the 0 inch amount. The big impact will be the cold temperatures late Thursday into Friday, it may be a shock to some people so plan accordingly. This storm looks pretty unimpressive, unfortunately we could really use the moisture out of a storm like this but it looks like that probably won’t work out for us. We’ll keep an eye on it and pass along any changes. 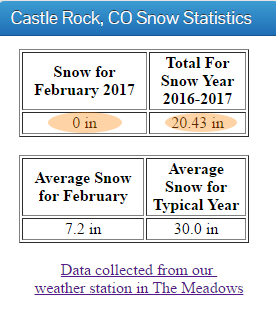 By the way, Castle Rock has not recorded any snowfall this month. This storm looks to be the last chance we may have for snow accumulation in February, otherwise we may have to wait until March. This storm doesn’t look that promising so we may very well end up at 0 inches for snowfall. Believe it or not, this is not super rare as February is often one of our drier months. We’ll look to March to hopefully make up our moisture deficit, we are now running about 10 inches below average for snowfall in Castle Rock.